Audioboo, the ‘instant podcasting’ service for iPhone, Android and the web, is introducing an intriguing new feature today – the ability to leave anyone else on the service a voicemail message without having to know their phone number. The new ‘Messages’ function allows you to either record an audio message or upload an audio file to send to any other Audioboo member privately. In practice it works like an audio version of direct messages on Twitter, albeit with the ability to attach an image and geotagged location to each message. 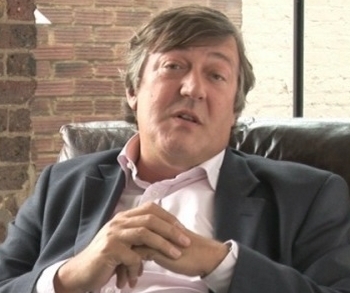 Stephen Fry, the much-loved actor, writer and tech geek, has recorded a message to welcome users to the new feature. An early adopter to Audioboo, we’re told that Fry donated the message as a gesture to show his love for the service. Although messaging is intended as a feature for paid-up ‘pro’ members of the service, the pro option (which we got an exclusive look at recently) isn’t ready to launch yet, so private messaging is being rolled out to all users for the time being. Initially it will only work via Audioboo’s web interface. The iPhone and Android apps will be updated with support for messaging in the near future. How will this be used? Audioboo CEO Mark Rock isn’t 100% sure yet but he’s hoping users will embrace it as a replacement for what he describes as the “outmoded” answerphone. “We’re quite excited by this but our users know best and time will tell if it’s really a feature that’s wanted or even needed”, he says. Audioboo suggests sending audio messages from a holiday, complete with a photo and location, or sending a late night message to a loved one. You could even send a message to a stranger to say that you love their Audioboo podcasts. The ability to send messages to any Audioboo member could be a gateway to spam of course, but preparing and uploading audio spam is a lot more effort than sending a text-based message. Still, Rock says “We are ready to amend (the service) if necessary. We’ll at least introduce blocking nuisance users sometime after launch along with anything else that users clamour for”. Being able to leave an audio message for anyone, as long as they’re an Audioboo user, without knowing their phone number is an intriguing proposition and a useful addition to Audioboo’s featureset. If successful, it may be a good idea for the company to market it as a completely separate service from its core podcasting and corporate audio services. Private messages are expected to be rolled out to all users today.